Around the Kumari cult and its development are many legends. This page is to be a collection of this legends and will be extended. The girl, who never loses in a game. One day, when king Prakash Malla went through his palace, he discovered a girl, who was playing Passa* with her friends. He observed her a while and saw, that she won every game. Because he was master in playing Passa*, he invited her several times to play a game with her. But also he never had a chance to win against her. After a while the king felt so much attracted by the girl, that he invited her into his private chambers. There he tried to seduce the girl. The girl got so furiously thereupon, that flames struck from her eyes. Now the king understood, that the girl in reality was the goddess Kali**. She cried and rioted and threatened to destroy his palace. Then she disappeared in front of his eyes. Some time later the goddess appeared to him in a dream and said: "I will give you a chance to recompense your bad behavior. You will select a virgin, who has to be admired in a temple. If she gets her first menstruation she will be a normal girl again and you have to find the next incarnation." The king accepted relieved and let build the Kumari Bahal immediately. * Tripasa is a game of dice. In some variants of this legend also is spoken about a kind of chess. That could be the game "Bagh Chal" (Moving Tigers), an old Nepalese strategy game. ** Durga, Kali, Taleju: Durga is the wife of the god Shiva and appears in different divine forms (good-natured and dreadful). 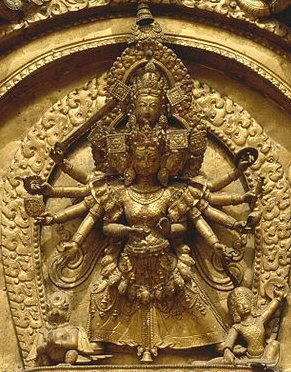 Two of her strongest forms are Durga (goddess of the perfection) and Kali (goddess of the destruction). 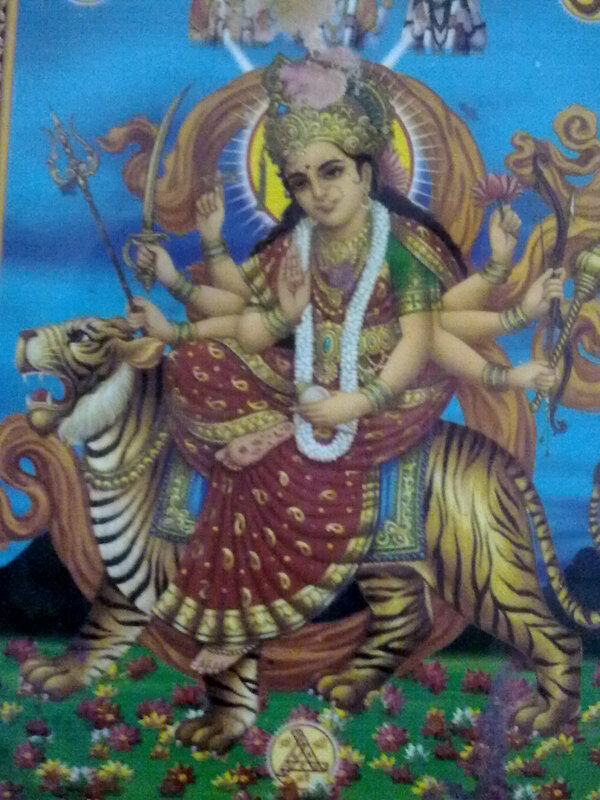 Durga has ten hands and much power and spiritedness (Shakti) and is riding a lion. In India just a few decades ago human sacrifices were brought to the goddess Kali. It was late at night, and the old brick palace in the centre of Kathmandu with its many courtyards, its many fine carved wooden windows and its pagoda towers, was dark. The courtiers, the retainers and the king's wives had gone to bed, and only the sleepy guards still patrolled. In one room, however, there was a dim light, and two figures could be seen huddling over a board and throwing dice. One was an unusually beautiful young woman, yet even the most casual of observers would notice that she was not only far too beautiful to be an ordinary mortal, but that she had an intense and penetrating third eye in the centre of her forehead. That she also had ten arms was less obvious, since she had a way of hiding 8 of them when they were not in use. She wore large golden earrings and golden tiara, and an aura glowed faintly around her head. The other figure was that of the king. One might have expected him to be dressed informally at this time of night, but in fact he was in full royal regalia with his crown, peacock feather and Jewels. As they threw the dice, they spoke in undertones, and though the king's manner was respectful, there was between them the easy familiarity of a couple of long acquaintance. "What to do about these restless six Pradhans of Lalitpur? And that Ghorkha Raja who threatens to swallow up every kingdom in his path?" asked the king, looking hopefully at the Young woman for an answer. "As to the first," she paused to throw the dice, and looked pleased with the result, "they pose little enough threat, and they should be handled with compassion so as not to alienate the people. But as to the latter ..."
There was no chance for her to finish, for at that point there was a disturbance, and the queen in night dress, followed by several armed attendants, bustled her way into the room. "So this is how I find you. Discussing matters of state indeed! And with such a beautiful young woman!" "But, my dear ..." the king began hopelessly. "Can't trust you out of my sight for a moment!" "Enough of this! " said the young woman, her voice full of authority, and indeed quite frightening as she drew herself up and spread her ten arms like wings. Eight of her ten hands held one of the attributes of her power. From her hips hung a belt of severed male heads, and she was now surrounded by an aura of flame. Three mare lovely but frightening faces had appeared, one above the first, the other two on either side. Both the king and queen drew back in awe, while the retainers dropped their weapons, dumbstruck. "That you would think such a thing of me! I'll not put up with such human frailties as jealousy. You have seen the last of me." "But how can I govern my kingdom without you?" pleaded the king. 'You cannot. Your reign will be short, and the end of your dynasty is near at hand." And with that, the goddess - for the queen in her jealousy had failed to recognise the goddess Taleju herself, wrathful aspect of Durga and patroness to the kings of Nepal - disappeared. "Now look what you have done with your snooping and your jealousy!" said the king. 'You could have simply minded your own business and let me mind mine!" So dependant had the king grown on the advice of the goddess that he despaired of being able to govern his kingdom without her, so all through the next day he made offerings and kept the Brahmins busy al the huge, three-storied pagoda where only he and the goddess's priests were allowed. Eventually his prayers were answered, or at least partially, for that night the goddess appeared to him again in a dream. "If you wish to see me again, choose a young virgin girl of the Shakya caste, beautiful and unblemished, with the 32 signs of perfection. Worship her as you would worship me. In her I will appear to you. But never will I forget the insult I have suffered." And so, after consulting his priests, the king did her bidding. A four year-old girl of the Newar Shakya caste was found who met all the criteria. She was taken to the Taleju temple and installed as the living embodiment of the goddess. She was worshipped by the king and adored by the populace at festivals. A little later a small but ornate palace and temple where she could live was built for her just across from the palace. Once a year, during the great Indra Jatra festival, the king went to her temple to receive her blessings in the form of a tika, a red mark on his forehead. Known as Kumari, the virgin goddess, or as Dyo Maiju to her own Newar people, as soon as she began to approach the age of womanhood she was replaced by a similar girl in order to assure that she would always be pure and unblemished and would never grow old. And so it continued throughout a change of dynasty, several centuries and many kings. Special thanks to Ms. Rashmila Shakya and Mr. Scott Berry. They have kindly given me the permission to use this text of the book "From Goddess to Mortal". It all began with a girl who never lost her milk tooth and was never scared of demons. Her clan claimed her as the divine Kumari. (Kumari is the name given to an unmarried girl). The King was furious at this strange arrogance of a petty tribe. He ordered the exile of the child. Months later, the queen fell sick. None could cure her disease. The queen thereupon reasoned the cause of her illness to the King�s act of exiling the Kumari. The king brought back the girl and recognized her claim. Health was restored in the palace and the kingdom. Since then, Nepal worships her as an incarnation in the form of "Taleju". Once a year, in the month of September, the King of Nepal visits her house, the Kumari Bahal, to pay homage. Then she is carried through the town in a grand procession to assure Kathmandu of her protection. At the end of November 2009 I coincidentally came across a video with the title "Kumari Dance" at YouTube. During my investigation I have found a further legend, which could be another root of the Kumari tradition.